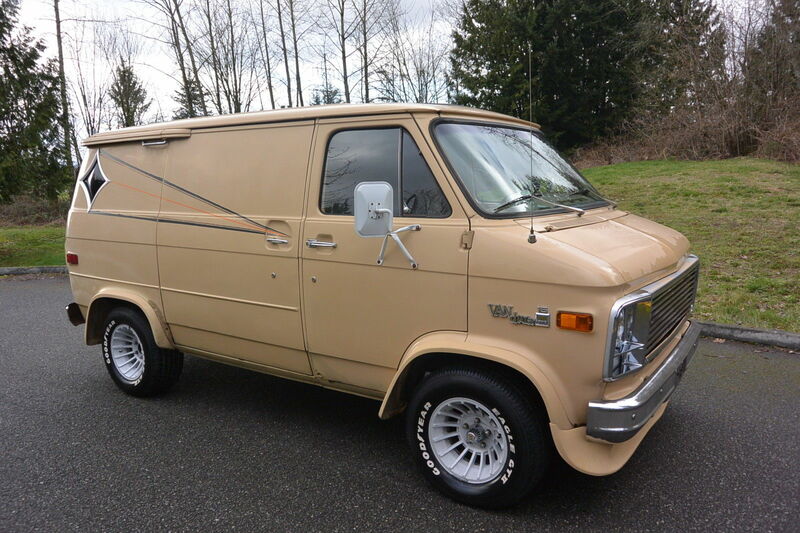 Take a look at this 1978 Chevrolet G20 Van here on eBay bidding for $2,266 with auction ending on Tuesday at 6:45PM PST. Warranty: Vehicle does NOT have an existing warranty Sub Model: 1 OWNER! 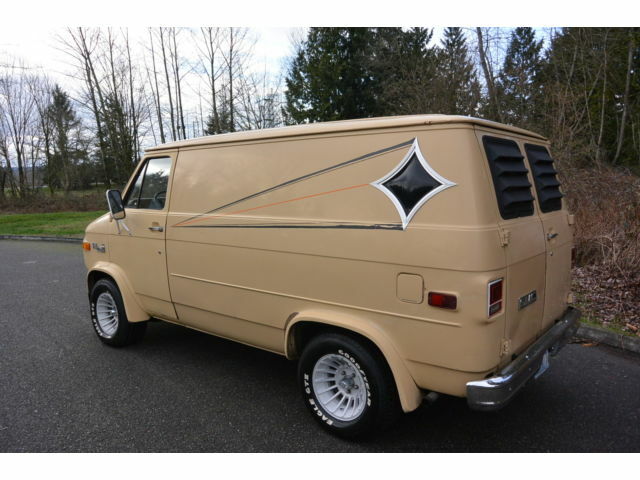 AS YOU CAN TELL BY OUR NAME OR OUR PAST AUCTIONS YOU MAY HAVE SEEN THAT WE ARE ALWAYS ON THE HUNT FOR ODD BALLS, CLEAN CLASSIC ORIGINAL SURVIVORS AND CLASSIC TRUCKS, SO THIS VAN BEING THE PERFECT COMBO OFF ALL I HAD TO HAVE IT. THAT OF COURSE IS ALSO MY DOWN FALL AND SOMETIMES I GET EMOTIONALLY INVOLVED IN VEHICLES IN WHAT THEY CAN BE WITH A LITTLE WORK AND JUST WANT TO BREATHE THAT NEW LIFE INTO THEM, BUT IT ALSO CAN OFTEN BE CALLED A PROBLEM OR HORDING:) SO WITH FUTURE PLANS ON LARGER PERSONAL PROJECTS IV REALIZED I HAVE TO THIN THE HEARD ON MY STASH OF SOME VEHICLES AND RESTORATION PROJECT TRUCKS , SO YOU MAY SEE A FEW GREAT CANDIDATES FILTER OUT HERE IN THERE IN THE HIGHBOY, C10 AND IH SCOUT DEPARTMENT (MY THREE SOFT SPOTS) WITH THAT SAID THIS TRUCK WITH A LITTLE BIT OF WORK CAN HONESTLY BE LEFT ASCETICALLY AS-IS AND DRIVEN FOR YEARS AND YEARS JUST AS IT HAS, BUT I COULDN'T IMAGINE A MORE HONEST OR DESERVING CANDIDATE FOR A PARTIAL SYMPATHETIC RESTORATION TO A FULL FRAME OFF BUILD AS IT IS A TRUE ORIGINAL AND ICONIC 70'S CLASSIC!!! THIS TRUCK IS FROM AN ERA WHEN LIFE WAS TRULY DIFFERENT AND MANY OF US RESPECT AND LOOK BACK IN FONDNESS. THIS VAN ONLY HAS S 5 DIGIT ODOMETER THAT SHOWS 04403 AND ROLLS OVER AT 100K, SO WE WERE TOLD IT ROLLED ONCE MAKING IT 104404. IT IS EXEMPT AND WILL SAY THAT ON THE PURCHASE ORDER, BUT THE TITLE IS THE 78 ORIGINAL. THIS TRUCK CAME WITH 305 V8, TH350 AUTOMATIC, POWER DISC BRAKES UP FRONT AND POWER STEERING. THE MOTOR IS GETTING TIRES AND DOES SMOKE SOMETIME, SO PLEASE REAR FURTHER AND WATCH THE VIDEOS TO GET THE BEST IDEA OF THIS BEAUTY. BODY- THIS IS A PRETTY SOLID OLD GMC THAT IS IN WHAT I WOULD SAY 80+% ORIGINAL PAINT AND 95% RUST FREE. AS MENTIONED ABOVE THE REAR BARN DOORS HAVE PEEN SPRAYED AT SOME POINT AND DECADES AGO THE OWNER HAD THE GMC BLOCK LETTERS SHAVED OFF OF THE HOOD AND THE TOP OF FENDERS AND HOOD WERE RESPRAYED AND BLENDED INTO THE ORIGINAL. THE ORIGINAL PAINT YOU SEE WOULD BUFF OUT TO A NICE SHINE, BUT THE REPAINTED AREA ONT HE HOOD AND TOP OF FENDERS HAS NOT AGED AS WELL AND HAS PEELED BACK SOME OR OXIDIZED AT A DIFFERENT RATE THEN THE ORIGINAL. THIS TRUCK HAS THE LOOK AND PATINA OF A 30-40 YEAR OLD ORIGINAL PAINT TRUCK WITH MILD WEAR AND TEAR OF CHIPS AND SCRATCHES THROUGHOUT THE BODY, BUT NO ACCIDENTS OR DENTS AND IT HAS ALL THE ORIGINAL SHEET METAL. THE PAINT STILL HAS A NICE PRESENTATION AND LOOK WITH THE WEAR, BUT TO ME THE BODY AND PAINT IS THE GREAT THING ABOUT THIS TRUCK BECAUSE YOU REALLY CAN'T HIDE ANY ISSUES, IT SIMPLY SHOWS YOU WHAT IT NEEDS. IT HAS SOME OF YOUR TYPICAL RUST AREAS OF VAN THAT YOU JUST CAN'T SEEM TO GET PAST ON THE ORIGINAL VANS WITH RUST ON THE BOTTOM FRONT FENDER JUST BELOW THE BUMPER, SOME ON THE BOTTOM OUTER CORNERS OF THE FRONT DOORS, SMALL BUBBLE ON RIGHT REAR DOOR BOTTOM, SMALL BUBBLING ON DRIVER FRONT BOTTOM ARCH OF DOOR, SURFACE RUST ON FRONT RAIN GUTTER AREA, SOME SURFACE RUSTING ON INNER METAL JUST ABOVE FRONT WINDSHIELD, SURFACE RUSTING AROUND HINGES AND BOTTOM INNER EDGES OF REAR BARN DOORS. THE FLOORS, INNER / OUTER ROCKERS AND BODY MOUNTS ALL ARE NICE AND SOLID ALONG WITH THE DOOR ENTRY AREAS AND THE INSIDE EDGES OF FRONT DOORS LOOK AMAZING. THERE IS SOME SMALL DINGS ON THE DRIVER UPPER REAR PANEL WITH NO PAINT DAMAGE THAT COULD BE MASSAGED OUT BY A PAINT LESS DENT GUY. THE FRONT AND REAR BARN DOORS DOORS SHUT NICE AND TIGHT WITH NO SAG IN THE HINGES, THE RIGHT SIDE DOOR SLIDES SMOOTHLY, POPS OPEN EASILY AND USUALLY CLOSES WITHOUT A ISSUE , BUT SOMETIMES THE REAR LATCH MECHANISM IS A LITTLE LOOSE AND THE ARM WILL SOME TIMES FALL DOWN TO THE CLOSED POSITION, SO YOU HAVE TO JUST POP IT UP WITH YOUR FINGER TO LATCH THE DOOR CLOSED. ALL GLASS IS IN GOOD SHAPE AND I BELIEVE IS ORIGINAL WITH THE AGED FOGGING ON THE SIDES AND HAS A COUPLE SMALL CHIPS ON THE WINDSHIELD. IT HAS TIGHT AND LOCKING FLY WINDOWS, SIDE WINDOWS ROLL UP AND DOWN SMOOTHLY, DOORS LOCK EASILY WITH THE KEY OR BY HAND INSIDE. IN THE DAY THIS GMC VAN WAS FULLY OPTIONED FROM THE FACTORY WITH CUSTOM DELUXE EXTERIOR TRIM PKG WITH FULL CHROME EXTERIOR TRIM. THE GRILLE AND LENSES ARE ALL IN NICE SHAPE ALONG WITH THE FRONT BUMPER, BUT THEY ARE ORIGINAL AND DO SHOW AGE ALONG WITH THE REAR THAT HAS SEEN SOME ACTION OVER THE YEARS WITH SOME AGE AND SLIGHT FOGGING OF THE CHROME AND SOME SMALL SURFACE RUST SPOTS. ALL THE RUBBER SEALS ARE ORIGINAL AND SHOW IT WITH SOME FADING, DRY ROT AND CRACKS BUT DO THEIR. THE PIN STRIPING UP THE SIDES TO THE REAR STAR WINDOWS IS AGED WITH SOME CRACKING AND SMALL CHIPPED AREAS, BUT IT IS EASILY REMOVABLE. THE REAR WINDOW SLAT COVERS ARE IN EXCELLENT SHAPE WITH NO CRACKS OR CHIPS, THE FIBERGLASS FRONT SPOILER AMAZINGLY HAS NO CURB CATCH MARKS, CHIPS, SCRATCHES OR SCUFFS ALONG WITH THE FENDER FLARES THAT ALSO HAVE NO CRACKS OR DAMAGE BESIDES THE STONE CHIPPING ON THE REAR FRONT OF THE FLARES FROM THE FAT 60 SERIES FRONT TIRES THROWING ROCKS BACK OVER THE PAST 38 YEARS. THE RIGHT DOOR ALSO HAS A SMALL AREA OF PAINT THAT WAS SPRAYED OVER THE BOTTOM REAR RUSTED AREA.THE KILLER LOOKING AND SUPER HARD TO FIND WESTERN TURBINE MAG WHEELS ARE IN GREAT SHAPE WITH NO CURBING OR SCUFFS AND ARE MISSING JUST ONE CENTER CAP ON THE RIGHT REAR, BUT THEY ARE WRAPPED IN NICE RAISED WHITE LETTER TIRES WITH NO SIGNS OF AG, ROLL SMOOTH AND LOOK JUST RIGHT ON THIS CLASSIC MUSCLE VAN. OVERALL THIS IS A KILLER TRUCK WITH A ICONIC 70'S LOOK THAT IS RARELY SEEN NOT ONLY ON THE ROADS TODAY, BUT ALSO AT CAR SHOWS NOW DAYS. THIS GMC SHOWS USE, AGE AND WEAR OF THE YEARS, BUT ALSO STILL SHOWS THE LOVE IT RECEIVED TO KEEP IT THIS INTACT AND CORRECT. I HAVE MANY CLOSE UP PICS OF THE TRIM AND PAINT THAT CAN ALSO BE SEEN IN THE VIDEO ALONG WITH ANY WEAR IN THE PAINT, BUT IF MORE ARE NEEDED LET ME KNOW. INTERIOR- INSIDE IT IS ALL ORIGINAL AND BESIDES A LITTLE MISSING CARPET IT IS FULLY 70'S IN THE FLESH! FULL CUSTOM SHAG CARPET FROM FRONT TO BACK AND WALL TO SEALING. 360 ROTATING CAPTAIN STYLE CHAIRS UP FRONT, U SHAPED REAR BENCH SEAT WITH STORAGE AND STEREO SPEAKERS. CUSTOM HEADLINER AND LIGHTING WITH DUAL FRONT AND REAR SUNROOFS! 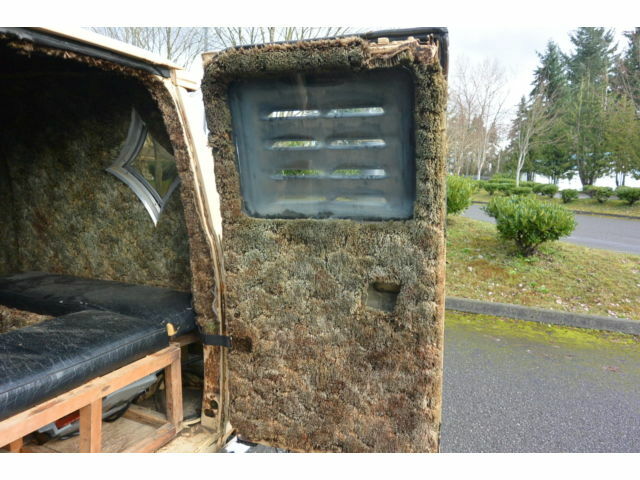 NICE AND INTACT DOOR PANELS THAT SHOW SOME SMALL AGING AND WEAR ON THE ARM RESTS, THE CARPET FRONT SEATS ARE SUN DIED ON TOP AREAS AND HAVE OBVIOUS WEAR ON THE DRIVER ENTRY SIDE. THE CARPET HAS BEEN PULLED UP FRONT THAT SHOW THE NICE SOLID FLOORS AND THE REAR CARPET IS SUN FADED IN AREAS AND DOES SHOW AGE, BUT IS AMAZING NON THE LESS TO STILL LOOK AS GOOD AS IT DOES AFTER 38 YEARS. THE INTERIOR COULD USE WORK AS THE STEREO DOES NOT POWER UP ANY LONGER, MISSING ONE SUN VISOR AND ALL GAUGES WORK EXCEPT THE VOLT AND OIL PRESSURE. THE TOP CENTER ENGINE COVER THAT HAS THE CUP HOLDERS DOES RATTLE A LITTLE OVER BIG BUMPS AND THE SUNROOFS DO NOT LEAK, BUT THEY ARE CHEAP OLD STYLE SUNROOFS THAT HAVE JUST PLAIN FLAT GLASS, SO IF IT SITS OUTSIDE IN THE WET AND COLD FOR LONG TIMES IT WILL SOMETIMES GET CONDENSATION DRIPPING FROM THE GLASS, BUT NOT FROM AROUND THE GLASS. THIS TRUCK WAS ALWAYS STORED INSIDE UNTIL WE GOT IT AND IS ONE OF THE MAIN REASONS WE HAVE DECIDED TO PASS THIS TRUCK ON BECAUSE WE DON'T WANT TO SEE IT DETERIORATE OR HAVE THE ROOF START LEAKING DURING OUR OWNERSHIP. 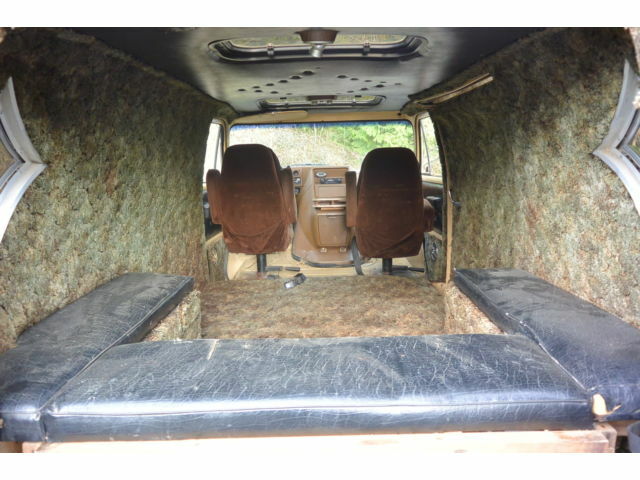 THE STEERING COLUMN IS NICE AND TIGHT FREE OF AND WOBBLE OR BUSHING DAMAGE, DASH AND DOME LIGHT WORK AND THE HEATER BLOWER MOTOR WORKS EXCELLENT THAT SOUNDS NICE AND QUIET. FOR A 38 YEARS OLD CUSTOM IT SHOWS IT'S AGE , BUT A LOT LESS THEM MOST VEHICLES OF THIS ERA THAT ARE LUCKY USUALLY JUST HAVE THE PARTS THERE LET ALONE IN THIS SHAPE! MECHANICAL- THIS OLD GMC ALWAYS FIRES RIGHT UP NO MATTER HOW LONG IT SITS WITH NO BATTERY DRAW AND A PROPER WORKING ELECTRIC CHOKE. THIS VAN DRIVES DOWN THE ROAD GOOD, SHIFTS THROUGH ALL 3 GEARS NICELY, NO SLIP IN REVERS AND HAS A PROPERLY WORKING AND ADJUSTED THROTTLE KICK-DOWN. THE POWER STEERING IS QUICK RATION STEERING BOX THAT MAKES FOR FUN AND VERY EASY DRIVING AND HAS JUST A TINY BIT OF FREE PLAY IN THE WHEEL. THIS VAN HAS CLEAN OIL, TRANSMISSION FLUID, FRESH ANTIFREEZE AND BLAKE FLUID. THERE IS NO COOLING ISSUES AND THE BRAKES STOP SMOOTH AND STRAIGHT WITH NICE PRESSURE THANKS TO A MASTER CYLINDER REPLACED NOT TOO LONG AGO. I BELIEVE IT WILL NEED A NEUTRAL SAFETY SWITCH BECAUSE I USUALLY HAVE TO START I IN NEUTRAL AND ONLY IF IT GET IT IN THE PERFECT SPOT OF PARK WILL IT FIRE UP FROM THERE. IT HAS THE ORIGINAL 305 V8 AND AS DESCRIBED ABOVE IT IS GETTING TIRED. IT HAS PLENTY OF POWER AND PULLS PRETTY SMOOTH AND IDLES OUT FINE, BUT IT IS A LITTLE UGLY WITH OLD SEALS AND GREASE STACKED ON IT AND IT DOES SMOKE AT TIMES. THE MORE YOU DRIVE IT THE LESS IT SMOKES. IF YOU LET IT SIT FOR WEEKS ON END IF YOU FIRE IT UP AND HIT THE ROAD YOUR FIRST COUPLE BLOCKS WONT BE PRETTY AND A FIRE TRUCK MAY BE CHASING YOU DOWN, BUT IT MOSTLY BURNS OFF AS THE MOTOR WARMS UP, SO IF YOU DRIVE IT REGULARLY OR AT LEAST LET IT RUN FOR A WHILE TO CLEAR OUT THE OIL THAT HAS SEEPED DOWN IN THERE IT'S NOT AS MUCH OF A PROBLEM. AT HIGHER SPEEDS IT'S NOT EVEN NOTICEABLE, BUT IT WILL EVENTUALLY GET WORSE AND THE 305 WAS NEVER THE PINNACLE OF POWER ANYWAY, SO OUR PLANS WERE TO PULL IT, CLEAN IT UP AND OFFER IT AS THE ORIGINAL MOTOR COMES WITH, BUT REPLACE IT WITH A NICE MODERN HIGHER HORSE POWER CRATE MOTOR AND YES SIDE PIPES WERE THE EVENTUAL PLAN AS THEY WOULD LOOK KILLER ON THIS SWB VAN AND GIVE IT THAT FINISHING TOUCH. THE TRANS SHIFTS GREAT, SO WE WERE JUST GONNA HAVE IT CHECKED OUT WHILE OUT AND IF CAME BACK LOOKING GOOD JUST RESEAL IT. THE REAR-END AND ALL OTHER MECHANICAL ITEMS ARE IN GREAT SHAPE AND HAVE NO OTHER ISSUES. THIS TRUCK DOESN'T HAVE ANY BIG FLUID LEAKS AND THE EXHAUST LEAKS SO,ANY OF THE SMOKING GOES RIGHT OUT THE TAIL PIPE AND YOU DO NOT SMELL THAT OIL BURNING SMELL INSIDE EVEN AT IDLE. THE CENTER FAN PULLEY IS EITHER BENT OR A LIGHTLY LOOSE, SO IT MAKES A LITTLE BIT OF A WEIRD PULLEY SOUND, BUT NO SQUEALING AND AGAIN WE DIDN'T WORRY TOO MUCH. Bring a Black-Light (yeah, I know, wrong web site, but I could not resist).